Join us for our Bus Hop to 8 Wonderful Quilt Shops! Cost is just $150 and includes your ride on Cheeseman Coaches, meals, lodging and FUN!!! Give us a call to reserve your seat TODAY! 815-879-3739 ----Oh, we bet you would like to know the dates-Saturday, April 14 and Sunday, April 15. What a way to spend a great weekend!!! QUILTS OF VALOR Sew day - Saturday, Feb. 3 - 10 AM - 4 PM - Come in to Quilter's Garden and support the Quilts of Valor organization by making a block to be donated. No need to bring your sewing machine. Kits will be available for $3.99 to make a floating star block. You may also stop in before the sew day, pick up a pattern, and bring your finished block in to the store on Feb. 3. Not to worry--we will also accept your blocks anytime! We will also accept your red, white or cream and blue fabrics to pass on to the organizers! 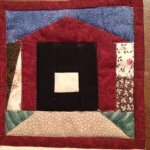 Aunt Sewzy will be at the Covered Bridge Quilters meeting at The Presbyterian church- 320 Park Ave E, Princeton, IL- on Thursday, Feb. 1 at 6:30 PM. We hope to see you there!